Pain management is a very important issue for Stonewall Jackson Memorial Hospital. Anesthesia is one means of managing pain during certain medical procedures. What is anesthesia? It is a gas or IV medication which causes the patient to temporarily lose sensation in all or part of their body. Scheduled for a procedure requiring anesthesia? Each patient meets with the Surgical Services staff and Nurse Anesthetist during a preoperative visit. During this visit, patients discuss their medical history, medications, past experiences with anesthesia and general health. Patients may ask questions and express concerns regarding their procedure at this time. The Nurse Anesthetist then determines the optimum anesthesia plan for each patient based on information provided during the preoperative visit and the patient's test results. The Nurse Anesthetist will administer the anesthetic, monitor the patient's vital signs and adjust the level of anesthetic as necessary. Top-notch anesthesia care is provided at SJMH by professionals with many years of experiece. Although one Nurse Anesthetist remains with the patient throughout the entire anesthetic course, all Nurse Anesthetists at SJMH work as a team to provide the most pleasant anesthetic experience possible. After surgery, each patient is taken to a Post-Anesthesia area for recovery. Surgical Services staff constantly monitors the patient's vital signs as the anesthesia's effects diminish. Medications may be administered to reduce pain after surgery. Risks and major side effects are rare. Millions of patients undergo anesthesia every year without incident. 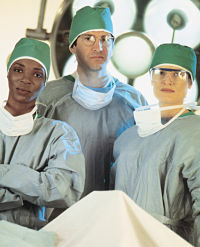 Technological advances in the field of anesthesia have significantly decreased even minor side effects such as nausea. How will a child react to anesthesia? Our Nurse Anesthetists have a wealth of training and experience with pediatric anesthesia. Children receive their initial anesthetic through a mask. Once they are asleep, an IV will be started. Children are more susceptible to minor side effects like nausea but medications can be prescribed to combat them.